Fluctuation electron microscopy (FEM) is an electron microscopy technique that is uniquely sensitive to nanometer-scale or “medium-range” order in disordered materials. It was originally proposed by M. M. J. Treacy and J. M. Gibson in 1996 (Treacy and Gibson, 1996). This page gives a general introduction to the technique. An annotated bibliography of publications related to FEM and a description of the discoveries made with FEM may be found elsewhere. The citations in this page and the others refer to the bibliography. This site was written and is maintained by the Voyles group at UW Madison. Paul Voyles was a student with Treacy and Gibson working on fluctuation microscopy of amorphous silicon. We’ve tried to cover the efforts of everyone working on the technique, but there is bound to still be some residual bias towards our own work. We welcome information about omissions, or any other questions or comments by email to voyles@engr.wisc.edu. If you are interested in our other work, please see the group homepage. This section provides a brief qualitative description of how FEM works and the sort of structure to which it is sensitive (Voyles et al. 2000a). A full theoretical treatment of the imaging process in terms of multi-body correlation functions may be found in Gibson et al. 2000a, Treacy and Gibson 1996, and Treacy and Gibson 1993. A detailed derivation of all the expressions in consistent notation may be found in Voyles’ dissertation (Voyles 2001c). 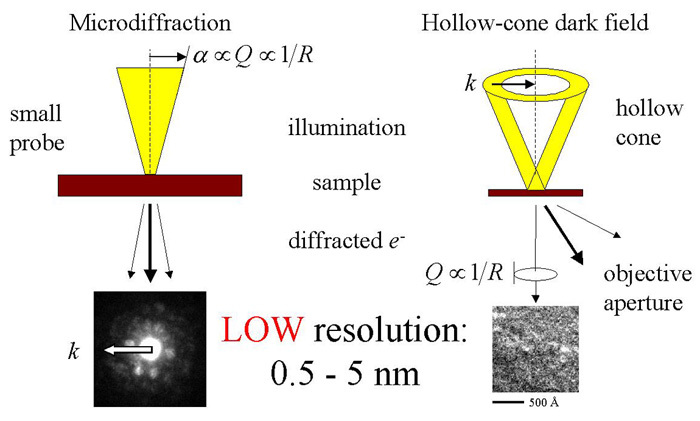 Fluctuation microscopy rests on the statistical analysis of the scattering from nanoscopic volumes of the sample. The theory is applicable to any diffracting radiation, but the requirement of significant diffraction from nanometer-sized volumes means that charged particles are currently the best probes, and a TEM is the ideal instrument. As illustrated in Figure 1, FEM measurements can be performed using dark-field imaging in a conventional TEM (Voyles et al. 1999, Treacy and Gibson 1996) or microdiffraction or imaging with a thin annular detector in a STEM (Voyles and Muller 2003, Cowley 2001). We measure the diffracted intensity, I(k, Q,r), where k is the scattering vector, Q is the reciprocal-space resolution, which is inversely related to the real-space resolution, and r is position on the sample. In dark-field TEM, the data are measured as images which contain many spatial (r) samples at one k and Q. In STEM microdiffraction, the data are measured as diffraction patterns, which contain many k samples at one r and Q. Figure 1: Imaging modes for the FEM. In either case, the measurements are performed at deliberately low image resolution. In a modern instrument with small spherical aberration coefficient this means that the FEM data set may be thought of as a position-resolved map of the diffracted intensity from mesoscopic volumes of the sample. The mesoscopic volumes have a lateral extent set by the image resolution at typically 0.5 – 5.0 nm and extend through the thickness of the sample (typically 25 nm). where the angle brackets indicate averaging over r. This function is sensitive to large excursions from the average in the diffracted intensity. Figure 2 below gives a cartoon picture of why this is sensitive to medium range order (Voyles et al. 2000a). Figure 2: Cartoon picture showing how V(k, Q) is sensitive to medium range order. Consider a diffraction-map image of two types of sample. One sample is homogeneous, such as a random network as shown on the left in Figure 2 or a perfect crystal . All of the mesoscopic volumes that contribute to the image have essentially the same structure and therefore the same diffracted intensity. This leads to an map with low variance. The second sample is heterogeneous, with randomly oriented ordered clusters, as show on the right in Figure 2. Some of the clusters will be near a Bragg diffraction condition and diffract strongly, leading to a bright spot in the image. Others will be far from a Bragg condition and will diffract very weakly, leading to a dark spot in the image. The resulting map will have a high variance. Now imagine what happens is we change the imaging conditions. If we vary k, V from the random sample won’t change much, since there aren’t any prominent pair spacings to modify the scattering. V from the ordered sample will change significantly, however, as we scan through maxima and minima in the structure factor of the clusters. If we vary Q, this effectively changes the sampling volume for the map. V for the random sample again won’t change much because there aren’t any intrinsic length scales longer than the bond length. V from the ordered sample will change, as we include more and more of each cluster, then more than one cluster inside each sampling volume. So we see from this simple example that a large V with significant structure in k and Qindicates a structure with significant MRO, while a small V with little structure in k and Q indicates a structure with little MRO. For full mathematical and experimental details of the technique, see the papers described in the bibliography. Overall, Voyles et al. 2000a is a good place to start. The theoretical development of the technique may be found in Treacy and Gibson 1993, Treacy and Gibson 1996, and Gibson et al 2000. Experimental details for dark field TEM are in Voyles et al 1999, and experimental details for STEM microdiffraction are in Voyles and Muller 2002. A full derivation of the theory in consistent notation and full details on the dark-field TEM experiments, including data analysis and automated image acquisition may be found in Ref. Voyles 2001a. Fluctuation microscopy has been used to study a variety of disordered materials. The first studies by Treacy and Gibson were performed on amorphous Ge (Treacy and Gibson 1997). These studies along with structural simulations by Keblinski lead to the development of the paracrystalline model for the structure of amorphous silicon and germanium [Treacy et al 1998], which has garnered enough attention and further work to have it ownpage. My work as a student of Treacy and Gibson focused on amorphous silicon and hydrogenated amorphous silicon Voyles et al 2001, Gibson et al 1998). We found an increase in MRO in thin-film a-Si deposited at increasing substrate temperature, which is readily explained by the paracrystalline model. Amorphous silicon formed by ion implantation damage has been studied by Ju-Yin Cheng (Cheng et al. 2001, Cheng et al. 2002), another student of Gibson’s. Tetrahedral amorphous carbon has been studied by Xidong Chen (Chen et al. 2001), another Gibson student and post-doc. All of these films are found to share the paracrystalline structure. Li, Gu and Hufnagel have used FEM to study Zr-based metallic glasses (Li et al. 2003, Li et al. 2001, Hufnagel et al. 2002). Bill Stratton in my group has measure Al-based metallic glass (Stratton et al. 2003). I’ve made the first step toward applying FEM to oxide materials (HfO2 and SiO2) (Ho et al. 2003), and Chen and Judith Yang have also studied aluminum and copper oxide films. Fluctuation microscopy has also been independently adopted by other researchers. Jing Li and Todd Hufnagel are investigating the structure of metallic glasses, and Will McBride and David Cockayne are also working on amorphous carbon (Mcbride 1999). Katherine Smith has just began an investigate of titanate nuclear-waste storage glasses. John Cowley has investigated FEM using a thin annular detector in the STEM (Cowley 2001), and suggested several other FEM-related microdiffraction techniques (Cowley 2002). Links to the individual or group web pages of all of these researchers may be found on the links page.